I’d like to become the kind of person who cares for things without caring about things—to keep my things in order, but to not get so attached to them that I lose my equanimity. Time to grow up. Time to learn how to maintain what I have, and how to choose new purchases well. Time to embrace repair and modification. Time to embrace the hours of research as an opportunity to geek out about something, like the way that W- knows a lot about kitchen knives and shoes. Time to spend for quality (but not over-engineering, or more quality than I can use). I want to know I can take care of nice things before I buy a lot of nice things. This can be a little difficult, because cheap things are often cheap because they’re not designed to be durable. I can practise some habits even before I upgrade stuff to see whether the habits are sustainable and useful. I’m gradually going to rotate out the things that I hadn’t taken care of so well, depending on whether I feel like upgrading them. But I’m also going to limit the things I care about upgrading. I don’t particularly feel the need to be part of the cashmere-and-pearls set. In terms of office wear, I can switch to blazers for now. 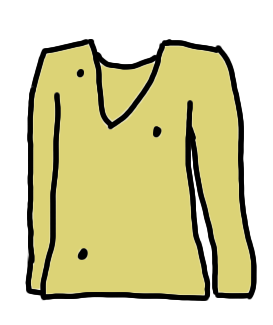 Even moth-eaten sweaters are still warm around the house. Who knows, maybe someday I’ll learn how to felt. I can learn to optimize for durability, though. I can learn to spot things that are worth the cost. I can learn to get better at squeezing out more from the things I have, so that they wear out properly. A stitch in time, and all that. I’ll figure this out eventually! During his Third Tuesday Toronto talk on How to Live an Amazing Life (see notes), C.C. Chapman saw me sketchnoting near the front and called it out as an example of a creative and unusual profession. He asked (probably rhetorically) how I explain it to other people. I said that I usually told people I was retired, which boggled even more people. He said I should tell my story more. It helped that I had never been buried in debt. I graduated without student loans, thanks to scholarships, assistantships, and my parents’ financial support. My mom had drilled into us the importance of never carrying a credit card balance and of living within our means. I’ve never had a car, so I’ve never had a car loan. W- owns the house we live in, so I’ve never had a mortgage. My parents are doing all right, and so far they haven’t had any major health issues. This gives me a lot more space than most people have, and I’m grateful for this excellent start. I had saved the majority of my income ever since I started working at IBM. I grew up reading personal finance books, so when I started working, I was excited by the opportunity to practise good habits and resist lifestyle inflation. I knew I wanted to try other things someday, and a good nest egg would help me with that. I remembered how my sister saved up for her trip to South Africa. She told us how she would say to herself something like: "One hamburger here, or one more day in Africa?" That made it easier for her to make frugal decisions. 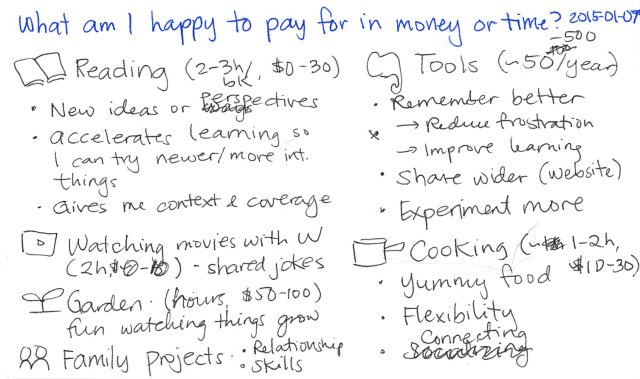 I also learned how to think about expenses in terms of how much time it took me to earn the money to pay for them. Was that purchase really worth several hours or even days of my life? Usually, the answer was no. Keeping my wants simple meant that I didn’t feel deprived. I kept the same lifestyle I had enjoyed as a graduate student, aside from occasional new expenses like buying office clothes. I still enjoyed home-cooked meals, books from the library, and taking public transit or my bicycle; I didn’t need to swap those out just because I was earning more. I didn’t buy designer handbags, perfume, or makeup. W- and I agreed that we wouldn’t buy each other gifts. Stuff was just stuff, after all. Reading books like A Guide to the Good Life: The Ancient Art of Stoic Joy helped me realize that a lot of luxuries that other people might consider part of happiness are entirely optional and could easily be substituted by inexpensive or free activities that I enjoy. I’m a happy person by default, and I’d learned early on that happiness doesn’t come if you chasing after it. That and growing up in an advertising photography studio probably helped me gain a resistance to marketing, which made it easy for me to focus on simple joys. I’d learned from Early Retirement Extreme and Mr. Money Mustache that reducing your expenses can drastically increase the rate at which you earn your freedom. A penny saved is more than a penny earned. If you spend $2 for every $4 you earn, you free up a year for every year you work. If you reduce that to $1 for every $4 you earn, you free up three years for every year you work. This gave me even more incentive to shift my spending to the things that really mattered to me instead of frittering it away. After I filled up a decent-sized emergency fund, I split my savings among long-term investments as well as a short-term opportunity fund. The long-term investments were for peace of mind, while the opportunity fund was for learning how to make better decisions. I figured that as long as I was saving at least 10-20% for the long term, I’d be well ahead of where most people would be at my age. In practice, I ended up saving much more than that, and it was liberating. Following Tim Ferriss’ advice in the 4-Hour Work Week to figure out the actual costs of your ideal lifestyle, I realized that I didn’t actually need that much money to support the modest lifestyle that I wanted. After tracking my expenses for more than seven years, I had a good idea of what my core and discretionary expenses were. When I estimated how much I needed, I was pleasantly surprised to discover that I was practically there in terms of my opportunity fund. I set aside what I needed for five years using laddered GICs, and I left my long-term investments alone as a safety net. As I was building up that opportunity fund, I started planning what I could do with it. I wanted to learn about building businesses that could fit into the kind of lifestyle I wanted: plenty of time at home with family and other interests. I talked to many mentors about their careers – consulting, web development, startups, small companies, large corporations. Many people wished they had more time, but they were handcuffed by their financial commitments: a mortgage, college educations, private schools, expensive hobbies, and so on. If I kept my expenses low and saved up enough, I could free myself (even temporarily), and then explore from there. I decided that instead of waiting until I had sorted everything out, I would take a risk and move some years from my "retirement," like the way Stefan Sagmeister interrupts his work with year-long sabbaticals. But I wanted more time than that, and five years seemed like a good chunk of time to work with. Statistically speaking, most businesses fail within their first five years. If I gave myself at least five years without worrying about cashflow, I probably had a decent chance of learning enough about business to build something that can last me a while. Besides, five years would be longer than my high school, longer than the time I spent in university, longer than the time I worked at IBM… If I could learn so much and grow so much during those periods, I should be able to make good use of five years too. I figured that if I could give myself the space to explore these possibilities, I should, since not many people get a chance to do so. Like the way I get ready for other risks, I plumbed the possibilities of failure. What if I ended up with nothing to show for the five years? I’d probably have at least a story, though – people are really good at rationalization. What if something happened to W-? If I kept in touch with people and I kept my skills sharp, I could probably go back into web development or consulting easily. What if? What if? What if? When I was comfortable with the downsides as well as the upsides, I gave myself the go-ahead. The timing worked out wonderfully. I had a one-on-one meeting scheduled with my manager to discuss the results of the yearly performance review. He told me that once again, I’d received a top rating. I told him that was fantastic – and that I was planning to leave in order to start on this experiment. I really liked working with IBM and was happy to leave at a convenient time for the team, so they asked me to stay on for a couple of projects that needed my web development skills. A few months later, I wrapped up all my work, and I started my experiment in February 2012. Thanks to amazing people, I hit the ground running. I had expected to flounder around a little trying to find ways to create value, but people stepped forward right away with suggestions. A former colleague had read my blog posts preparing for the experiment and wanted to know if I was interested in working with his team, so I had my first consulting client lined up. Another friend needed help with Rails development, so I experimented with that as well. I picked the brains of mentors who helped me spot opportunities and avoid pitfalls. I read forum messages and blog posts. There’s so much out there to learn from. 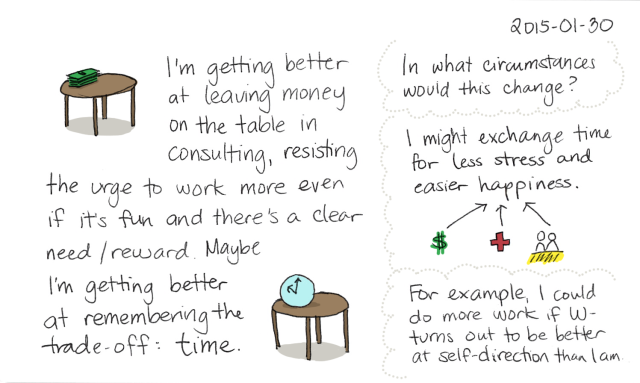 I tried out different business models and found ones resonated with me. I got better at floating ideas and getting to that first sale. 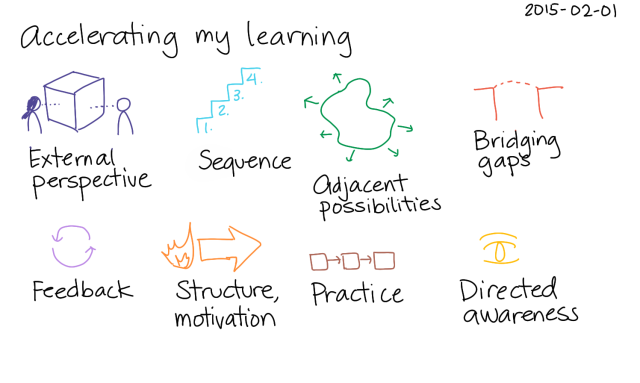 I dove deeper into skills that I wanted to improve, like sketchnoting and programming. If this is what I can learn in a little less than a year and a half, I can’t wait to see how the rest of the experiment will unfold. 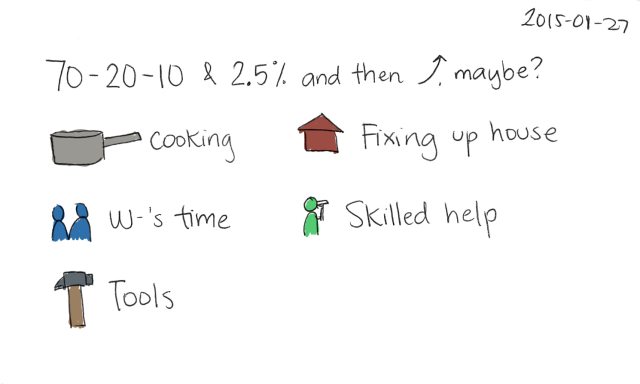 If things work out really, really well, this is how I imagine this five-year experiment succeeding: I’ve learned and shared a ton, and I’m ready for more. I could easily see it extending to a lifetime. Wouldn’t that be neat? After C.C. Chapman’s talk on how to live an amazing life, the people I chatted with told me they didn’t pick up anything particularly new, although they enjoyed his talk. Likewise, there’s very little that’s new in what I do, if there’s anything new at all. I just want to illuminate possibilities and show that you can get there in small, non-scary steps. 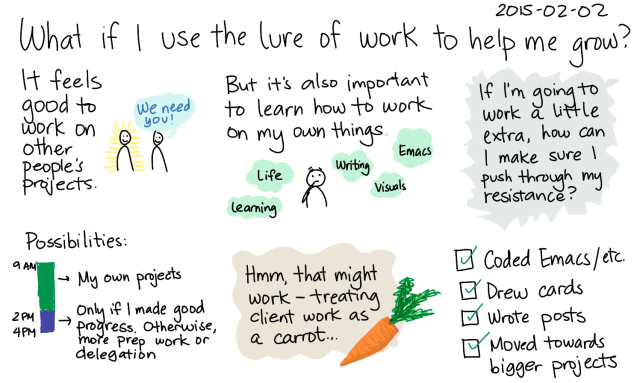 I want to help people explore these paths, whether it’s experimenting with life, quantifying/analyzing your decisions, sketching your notes and plans, writing code for fun… I work on this by learning, writing, drawing, and making things, and I’m going to get even better at this learn-share-scale cycle as we go on. Hack your wants. I have simple wants, and what I want the most is time. I deliberately dig into what I want and what I can give up. Wants are more changeable than you might think, and letting go of attachments can actually be pretty fun. Frugality follows naturally from this, and savings follow frugality. I think it’s easier to shape your wants than it is to force yourself to be frugal if you don’t want to be. Then save, save, save, because that safety net makes all sorts of interesting things possible (and less stressful). Have a supportive partner. This is a huge part of what makes it possible, and I often thank W- for helping me explore this experiment. He thinks it’s a good experiment and could possibly pay off well for us in terms of the decisions we want to make in life, and that means a lot to me. We have a simple lifestyle and are both frugal. It’s super-helpful to have a spouse who’s on the same financial page. It’s easy to imagine how this could’ve gone differently. If W- had disapproved of the idea or if we had a two-income mortgage, it would be much harder to explore this, or I might not even have tried it. I could probably have done this on my own, but it would have been more difficult to save up, the jump would have been much riskier, and it wouldn’t have been nearly as much fun. It’s a little difficult to tell people, "Oh, make sure you have a supportive partner," so this is not really advice. But if you do happen to have a supportive partner, work on making the most of life together. Be that supportive partner, too. Investing in relationships pays off a lot. Get help from other people, and help others. I learn a ton from people’s experiences as shared in books, blog posts, forum messages, e-mail, Skype / Google Hangout / phone / in-person conversations, and so forth. I get opportunities from people who are willing to take a bet on me. I always learn a lot while answering questions or helping people out. I’m amazed by the results of betting on other people, too – the world is a candy store of talents. Our wedding vacation was a whirlwind of cooking, thanks to the talents of my middle sister Kathy and our family friend Tita Gay. When the dust cleared, casualties included one burned-out stove element, and one broken toaster oven. We can work around the burned-out stove element easily – just use the other elements – but no toaster oven means that toast, biscuits, and tarts take more energy than before. W- took advantage of his electrical engineering training to troubleshoot the toaster. He identified the solenoid as the problem part. Now we’re figuring out if we should repair the toaster, replace it, or eliminate it. The decision is complicated by the fact that the toaster was an under-cabinet Black and Decker toaster oven, which was great because it saved counter space. Almost all toasters these days are countertop models, and we’d need to make space for them. The two under-cabinet models still sold by Black and Decker have middling reviews on Amazon.com. We’re going to try replacing the solenoid on our toaster first. If that doesn’t work, we might bring it into a small appliance repair shop (if we can still find one of those!). If that fails, then we’ll look into other options.